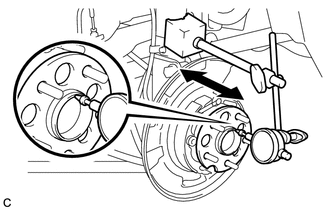 (a) Using a dial indicator, check for looseness near the center of the axle hub. Ensure that the dial indicator is set perpendicular to the measurement surface. If the looseness exceeds the maximum, replace the rear axle hub and bearing assembly. 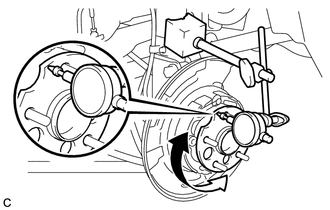 (a) Using a dial indicator, check for runout on the surface of the axle hub outside the hub bolt. If the runout exceeds the maximum, replace the rear axle hub and bearing assembly.